While you may absolutely love every item in your home from your kids’ artwork on the fridge to your grandmother’s antique bed that dominates the guest bedroom, they may not help you sell your house. This is where effective staging can make all of the difference. In a study by the Real Estate Staging Association it was found that staging a home reduced the days on market by 72%. The association arrived at this number after evaluating 63 homes that had been on the market for an average of 143 days. These homes were then staged and received offers within 40 days on average. Compare that to 481 homes that were staged before listing which received offers in 23 days on average. That is huge! Each mortgage payment you don’t have to pay is money in your pocket. Nearly every buyer views properties online before ever setting foot in a home. 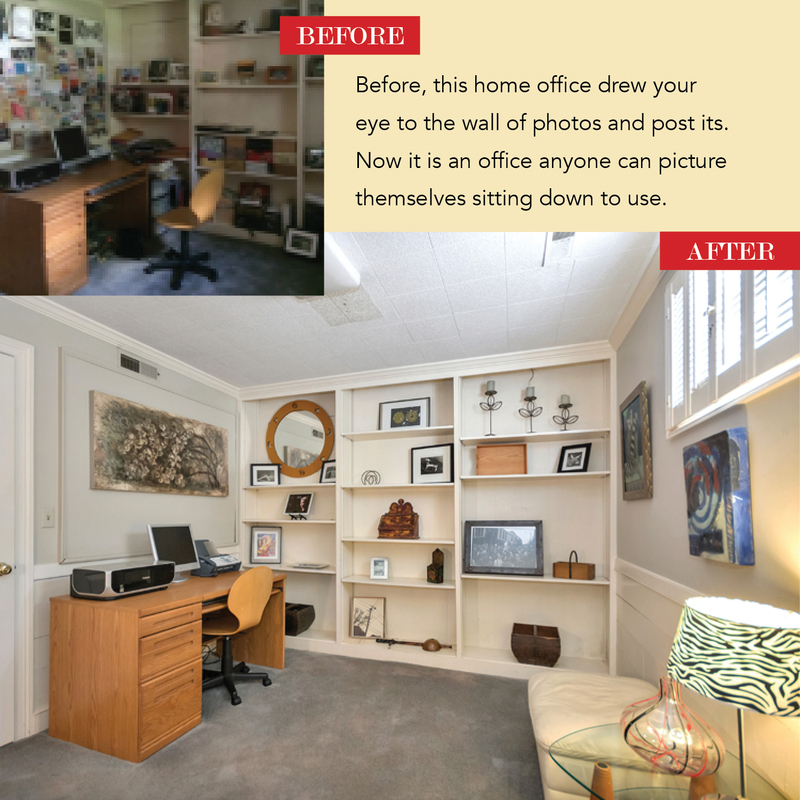 Thus the photographs in your listing are crucial in making a great first impression is so vital. Good staging and great photography can take a home from being one a buyer passes over online to a home the buyer has to see now! 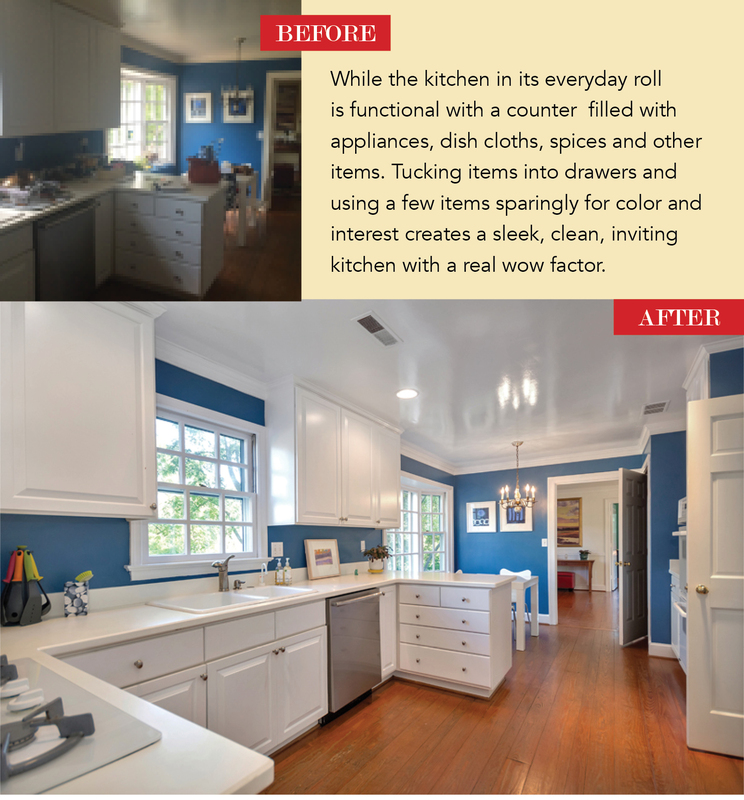 The talented home stager Gail Hoerr at Redesign and photographer Abby Inman with VA Home Pics brought this listing to the next level. 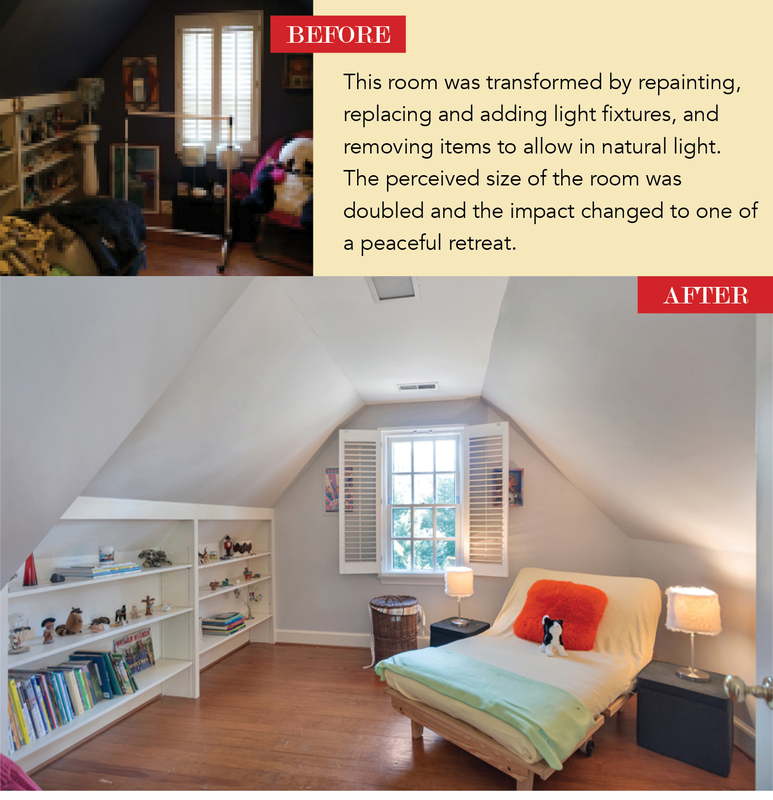 Here are some before and after pictures to highlight a few of the main principles of staging and the importance of great photography. While many talk about the three L’s of real estate (Location, location, location!) the three D’s of staging are definitely Declutter, Declutter, Declutter! 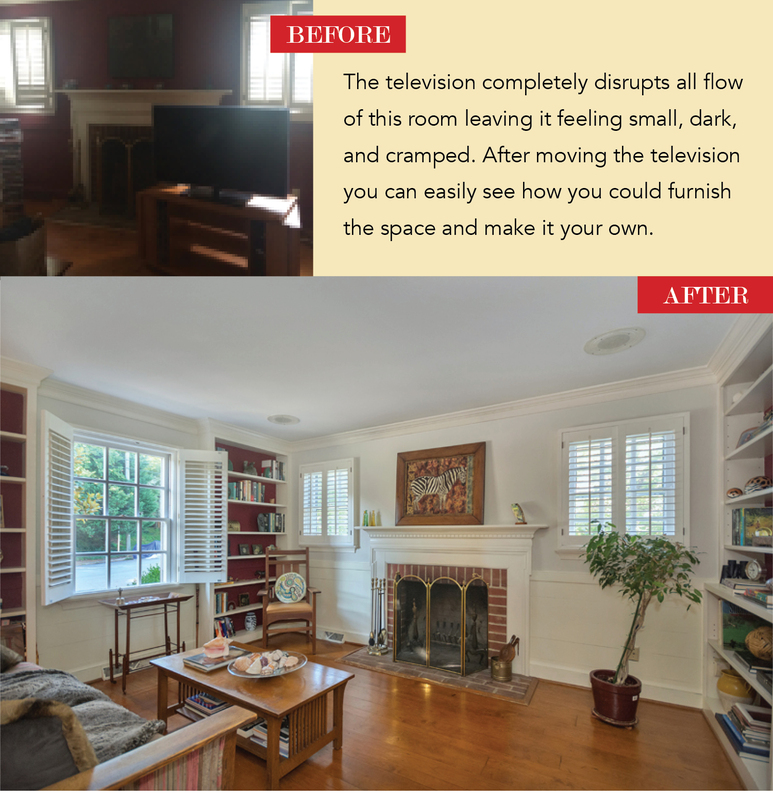 This strategy is utilized at every step of this staging project. It is important to every room feel spacious, airy, and well lit to allow the potential home buyers to see themselves living in the space. Dark cramped areas are overlooked, forgettable, and viewed as unusable space. Depersonalization and decluttering go hand in hand. While decreasing the number of items is important so is decreasing the distractions. Buyers are there to view the house and its potential to fulfill their needs. Photos of a family vacation can make a viewer think about how they should take their kids to Paris rather than how this office is a great asset to the family member that works from home. Part of envisioning your life in a house is thinking of how you go about your day to day activities. The ability to seamlessly go from cooking in the kitchen to eating at the table to reading a book with a cup of tea in your favorite chair before bed should be easily envisioned. When choosing your real estate agent make sure they have the resources for staging and photography in order to garner your home with the most interest possible. 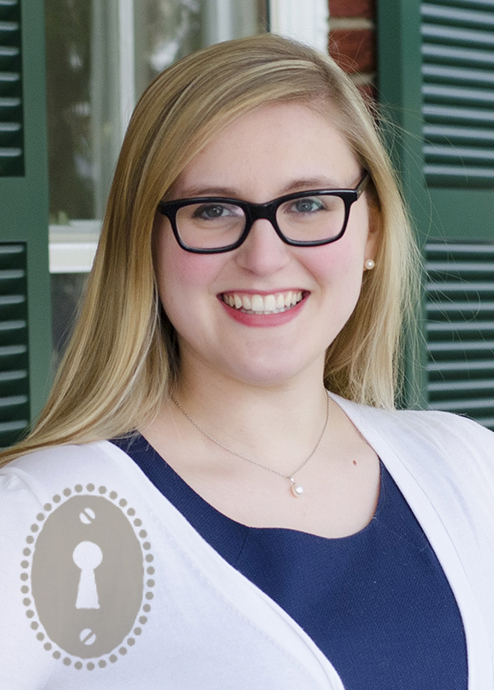 See more from Gail by visiting her website or blog!